Up in that Northern enclave of artistic agitation, aka Hebden Bridge, oddly and without rhyme nor reason also once home to The Wicked Witch’s Press Secretary, there lurks a one-man musical infinity engine by the name of Colin Robinson. Colin is a very industrious Yorkie chap who turns out albums like the world might end tomorrow, or more pertinently, anytime after the 20th of January. Colin’s musical vision under various nom de plumes usually encompasses a sparse alien funk with improvised embellishments, or occasional meanderings off into an alternative minimal rural ambience but this time around he’s been rooting about in the cupboard under the stairs and has emerged with armfuls of what might be termed interlude music, to be played as Jumble Hole Clough, so named after a local beauty spot. As he says himself, “it’s fookin’ dark down there” in the depths of his imagination, which seems to have veered off into a semi-remembered childhood reverie with the inklings of the bogeyman never far away. When not warming up the engines of solidarity and rage, or plotting resurrection for beginners in order to free folk so poor they had to make bread from tree bark, Colin seems to have a fascination with trains. The “salty armada” of the album title probably doesn’t bear too much thinking about, especially if you’re eating your tea while reading this. Here’s a JHC video completely unrelated to this album… see what I mean about trains? Nowt wrong with that, at all! 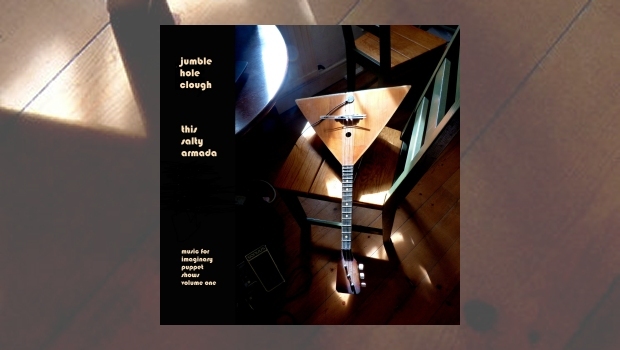 Musically, well you can hit the Bandcamp link and find out for yourself, but these miniature explorations into filmic possibility remind me in some small way of Morgan Fisher’s Minatures, albeit with a completely different agenda. Unlike the ex-Mott man, Colin does nearly all of this himself, the only track where assistance is sought being the languidly lolloping Fragment No.4 wherein Michael Linden West contributes “guitar and devices”. Colin’s primary instrument is actually the guitar, not that you would know from this record. There are glimpses into the guitar world as brief snatches attest, particularly the short spidery solo on Old Money’s Better Than New whose arrangement and synth backing puts me in mind of fellow Yorkie Bill Nelson who as a solo artist has sometimes trod a similar path to that shown on This Salty Armada, venturing into the possibilities offered by imaginary soundtracks. The playful nature of this album is indicated by its full title, but I would imagine the puppet show referred to would be scripted by Chekov. This is as serious as it is throwaway, a neat juxtaposition. Normally this is the sort of left-field fare that would remain on my blog – I’ve scribbled about Colin’s musical outpourings over there a few times in the past – but this man is rather talented and something of an unknown treasure in my humble opinion, so hopefully I can bring greater publicity to his back porch on these pages. 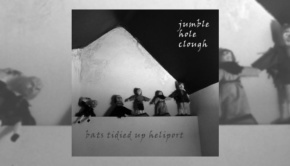 If you explore Jumble Hole Clough’s large discography over on Bandcamp, be sure to check out Colin’s other current project Churn Milk Joan where Colin is joined by ex-pat American and recently naturalised Brit Richard Knutson – a wise move or frying pan into fire scenario…only time will tell. In the Churn Milk Joan universe, the kitchen is full of marimbas and bluish translucently-skinned aliens cut rugs to the Spartan funk while throwing their many loose limbs around with gay abandon. And, of course, this and indeed everything Colin releases is all “Name Your Price”, so what have you to lose?